La Casa Pizzaria (yes, pizzaria) has been serving up their unique Neapolitan pizza in Midtown Omaha since the early 1950’s. The original Leavenworth location is considered an Omaha institution, but for those who’d like to stay out west they also have a location near 84th and I-80. 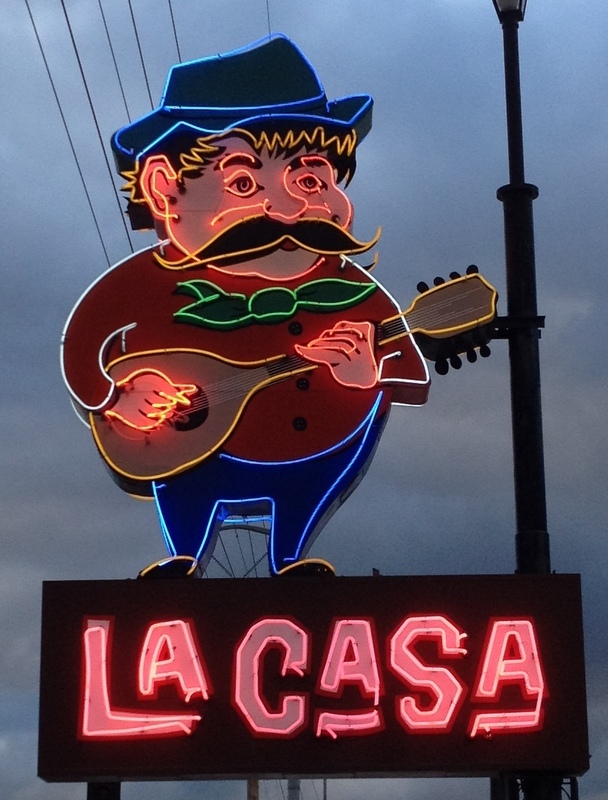 We wanted to get the full La Casa experience, so we opted to make the longer drive and visit their original location. It was just before 6pm on a Sunday, and the place was already packed. We were looking at a good 30 minute wait, so we decided to kick it in the bar with a Blue Moon and a Stella. If you’re in more of a rush, you can order and eat right in the bar or get your order to go and enjoy it at home – or in your car if you just can’t wait that long. Exactly 30 minutes later our name was called and we were taken to a table in the main dining area. It’s a good sized restaurant, a little dark and certainly dated, with local artwork and photos on the walls. I doubt much has changed over the years, but if it ain’t broke… Having studied the large menu in the bar over our beverages, we already already knew what we wanted by the time our waitress arrived. We decided on the toasted ravioli, salads, a veggie pizza, and a Carne Classico. After a wait that was probably shorter than it seemed (we were hungry! ), our half order of ravioli arrived with side of meat sauce for dipping along with a basket of fresh bread, which was an unexpected surprise. 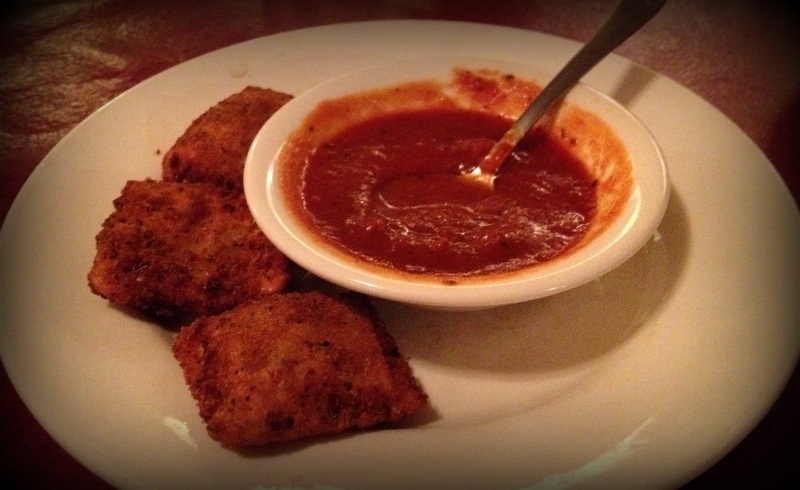 The ravioli is stuffed with beef, hand breaded and deep fried to golden perfection. They were crispy and flavorful. I was especially impressed with the meat sauce which was dark, rich, very flavorful, and absolutely delicious. I personally made sure none of the marinara made its way back to the kitchen. My dinner salad had a tasty creamy Romano dressing and The Pizza Wife’s spinach salad came with a under seasoned tomato vinaigrette dressing. Next came the stars of the show – the pizzas! La Casa produces a very unique crust not matched by anyone else in Omaha. It’s very thin, buttery, flaky with a charred and crispy bottom and edge. I prefer a slightly thicker and chewier crust, but I was really impressed with the taste and texture of theirs. The sauce is a very simple sauce, perhaps being nothing more than just pureed tomatoes. There wasn’t any hint of herbs or other ingredients in it. Another unique feature at La Casa is that you can choose to have Ramano or mozzarella cheese (or a mix of the two) as your topping. We stuck with mozzarella for both pies. 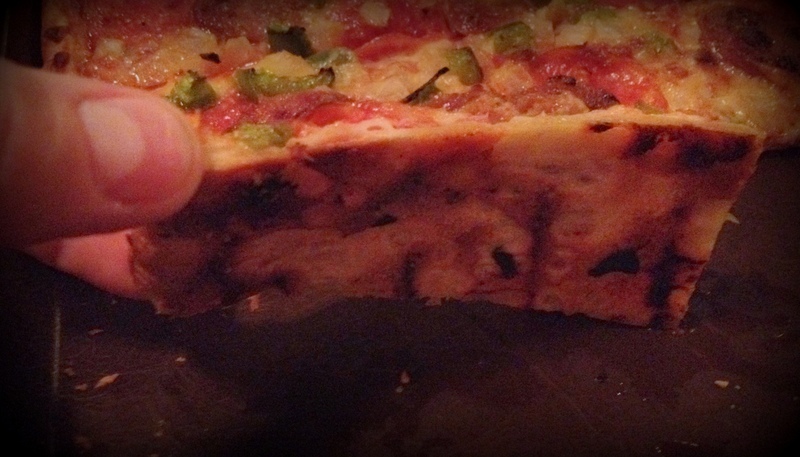 Another thing we noted was the small pizzas are round in shape while the medium and large pies are rectangular. The veggie pizza comes with diced tomatoes, mushrooms (which seemed to be fresh), black olives, onions and green peppers (no substitutions!). The Pizza Wife found it tasty but she isn’t a fan of the flaky crust. Like me, she prefers the foundation of a pie to be slightly thicker and chewier. 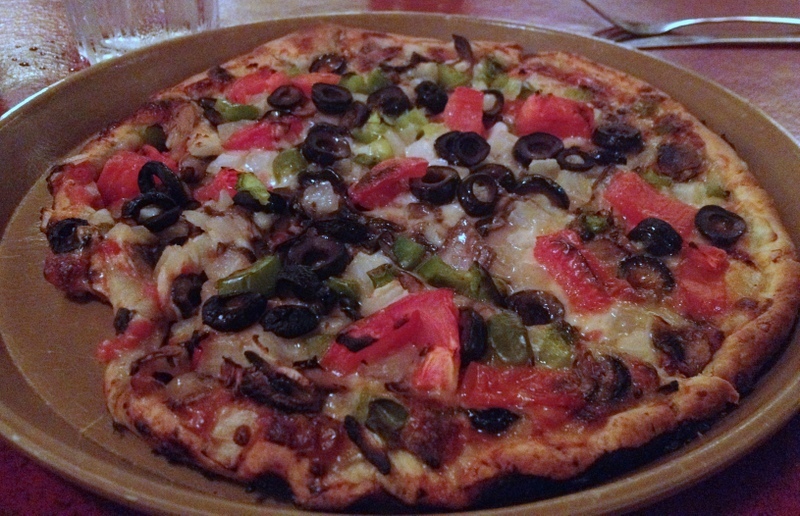 Also, La Casa is one of the many places that load their veggie pizzas with black olives. A few are fine, but The Pizza Wife would prefer more of the fresh vegetables. The sweet tang of diced tomatoes was a welcome surprise. 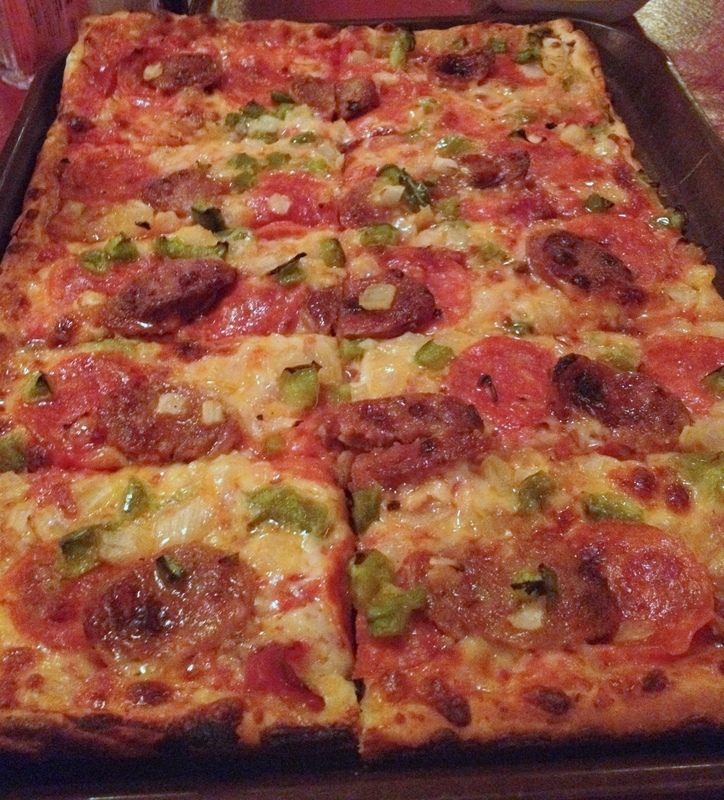 The Carne Classico features spicy Italian sausage, pepperoni, prosciutto, green peppers and onions. Again, no substitutions please. I normally don’t stray much from the standard pepperoni pizza, but the Carne Classico pizza just sounded so good on the menu. And it was. This was one of the best tasting pizzas I’ve had in some time. The sausage was spicy, tasty and was certainly the star of the show, while the rest of the toppings blended together nicely making this an instant classic. Overall we really enjoyed our visit to La Casa. I think I enjoyed the experience a little bit more than The Pizza Wife. This was one of the best tasting pies I had in a while. We found the prices of the pizzas to be on the higher side when compared to other places we’ve visited however. How would you rate La Casa Pizzaria’s Pizza? Click on the stars below! This entry was posted in Pizza and tagged La Casa Pizzaria. Bookmark the permalink.